Martin RB-57D-2 Model 796 53-3979 collecting atmospheric particle samples during Juniper nuclear bomb explosion; Operation Hardtack I Bikini atomic experiments, 22 July 1958. The Martin RB-57D Canberra was a specialized high-altitude strategic reconnaissance aircraft developed from the Martin B-57 Canberra tactical bomber, a licence-built version of the English Electric Canberra. It was used by the United States Air Force during the 1950s prior to operational use of the Lockheed U-2. The RB-57D was built strictly as a high-altitude reconnaissance aircraft. It originated in a December 1952 USAF study funded by the Wright Air Development Center for a turbojet-powered special reconnaissance aircraft with a radius of 2,000 nautical miles (3,700 km; 2,300 mi) that could operate at altitudes of 65,000 feet (20,000 m). Subsonic performance was considered to be acceptable and it was felt that no defensive armament would be needed. The RB-57D was unique and set the stage for high-altitude reconnaissance operations in the rarefied air of the stratosphere. Preliminary specifications were prepared by the Air Force on 27 March 1953. The project was carried out in high secrecy. It was known as Weapon System MX-2147, and the code name was Bald Eagle. The second major change to the RB-57D was the addition of Pratt & Whitney J57 engines in place of the Wright J65 engines used on all earlier B-57 models. The two J57 engines produced about 20,000 lbf (89.0 kN) total thrust, about 6,000 lbf (26.7 kN) more than the two J65 engines. Other changes in the D model included removal of all fuselage fuel tanks and the addition of "wet wing" fuel cells. All defensive armament was removed, and the bomb bay was also removed and replaced by avionics equipment. The horizontal stabilizer was changed to the variable incidence or "all flying" type. Spoilers were added to the outboard wings to assist the ailerons in roll axis control. The RB-57D remained in service for only about five years. The first deliveries were in April 1956 to the 4025th Strategic Reconnaissance Squadron, 4080th Strategic Reconnaissance Wing, which was a part of Strategic Air Command (SAC). Initially, the planes were to be based at Lockbourne AFB, Ohio, but they were soon relocated to Turner AFB, Georgia. The squadron would become fully operational with its first six RB-57Ds only 120 days from the delivery of its first RB-57D. Those first six aircraft, all Group A RB-57Ds, deployed Yokota AB, Japan and to Eielson AFB, Alaska in late 1956 for reconnaissance missions over what is presumed to be China, North Korea and the Soviet Union. 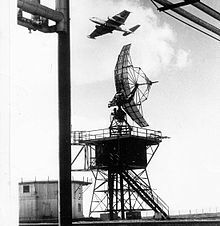 The detachment at Yokota was used to monitor fall-out from Soviet tests in Operation Sea Lion. Other sorties were flown over Communist China, the RB-57D's operational ceiling being well above that of Chinese MiG-15s. The Eielson-based aircraft conducted ELINT around the Kamchatka Peninsula of the Soviet Union. On 15 Dec 1956 three aircraft overflew Vladivostok. In early 1956, the 4080th SR Wing moved to Laughlin AFB, Texas. Midair-refuelling capable RB-57Ds (Group B and the sole Type C) were deployed in 1957 to Rhein-Main AB, West Germany to support USAFE operations. All RB-57D operations were under heavy security and very little information ever leaked out about their early operations. They presumably carried out ELINT/SIGINT missions along the East German border and over the Baltic Sea. Since the missions were carried out under an atmosphere of high secrecy, RB-57s returning from missions over the Baltic were often intercepted by RAF Hawker Hunter interceptors just to make sure that they were not Soviet aircraft. These particular versions of the RB-57Ds had the guts ripped out of the fuselage. They were equipped with an camera with a 24 feet (730 cm) focal length from lens to aperture. They produced individual frames that were developed as large as 4'x6' for CIA analysts to go over in great detail when looking for missile silos throughout Eastern Europe. The pilot and navigator who flew these missions never even got to view the film they shot. Upon landing a CIA employee would take the film before they even left their seats in their planes. When the 4025th SRS was inactivated in June 1959 the RB-57D aircraft were assigned to the 7407th Support Squadron at Rhein-Main AB, two additional aircraft added to complement including the unique RB-57D-1 equipped with SLR. Intelligence gathering sorties by the RB-57’s in West Germany continued until 1964 when wing fatigue problems caused type to be withdrawn from service. The RB-57Ds of the 4926th Test Squadron (later 1211th Test Squadron) at Kirtland AFB, New Mexico, participated in support of atomic bomb tests at Eniwetok Atoll in the Marshall Islands and at the AEC testing range in Nevada during 1957–1963. The high flying capability of the RB-57Ds allowed them to get nuclear particle samples from high in the atmosphere as part of the post-detonation analysis. In 1958, the Central Intelligence Agency started sponsoring a program known as Diamond Lil, in which Chinese Nationalist pilots were trained to fly RB-57Ds. Six Black Cat Squadron Taiwanese pilots were trained on the B-57C at Laughlin AFB, Texas, arriving back in Taiwan, and two or three Group A RB-57Ds were ferried to Taoyuan Air Base, near Taipei, Taiwan in early 1959. During early 1959, they carried out deep penetration reconnaissance flights over the Chinese mainland, photographing airfields, military establishments and ports. They flew in Republic of China Air Force markings, being painted white on top and black on the bottom with lettering stenciled in red. RB-57D "5643", piloted by Capt Ying-Chin Wang, was shot down and killed on 7 October 1959 by a People's Liberation Army SA-2 surface-to-air missile, which was the first successful shoot-down of an aircraft ever achieved by a SAM. It seems[who?][when?] that the pilot had made a premature descent while returning to Taiwan. The program ended around 1964, when fatigue problems with the wing spars forced the retirement of the surviving aircraft, which was returned to the US. They were replaced by four Lockheed U-2s, all of which were subsequently lost in operations over the Chinese mainland. Six more RB-57Ds were used to monitor the last series of American atmospheric nuclear tests which took place in 1962. Three RB-57Ds were assigned to the 1211th Test Squadron (Sampling) of the MATS Air Weather Service at Kirtland AFB, New Mexico and were re-designated WB-57D. Clarence "Kelly" Johnson of Lockheed submitted an unsolicited proposal on his own which eventually edged out the RB-57D design, resulting in the Lockheed U-2. The U-2 was a more capable aircraft and replaced the RB-57D in U.S. strategic reconnaissance units. 53-3982 – National Museum of the United States Air Force, Wright-Patterson AFB, Dayton, Ohio. This RB-57D is one of the 13 photoreconnaissance RB-57Ds. Painted as it appeared in the late 1950s while it served in the 4025th SRS(L), it went on display in 2004. 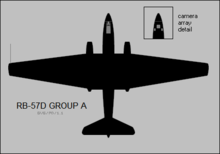 53-3982 (c/n 006) had no midair refuelling capability. Converted to EB-57D. To MASDC as BM0143 18 Jun 2002. On display at Pima Air and Space Museum, Tucson, AZ. Moved in 2005 to WPAFB, OH. Placed on display 2006 at National Museum of the United States Air Force at Wright-Patterson AFB in Dayton, Ohio. Wikimedia Commons has media related to Martin RB-57D Canberra. ^ "Martin RB-57D > National Museum of the US Air Force™ > Display". www.nationalmuseum.af.mil. Retrieved 30 July 2016. ^ "Martin RB-57D" National Museum of the USAF. Retrieved: 7 September 2015. This page was last edited on 3 March 2019, at 05:54 (UTC).